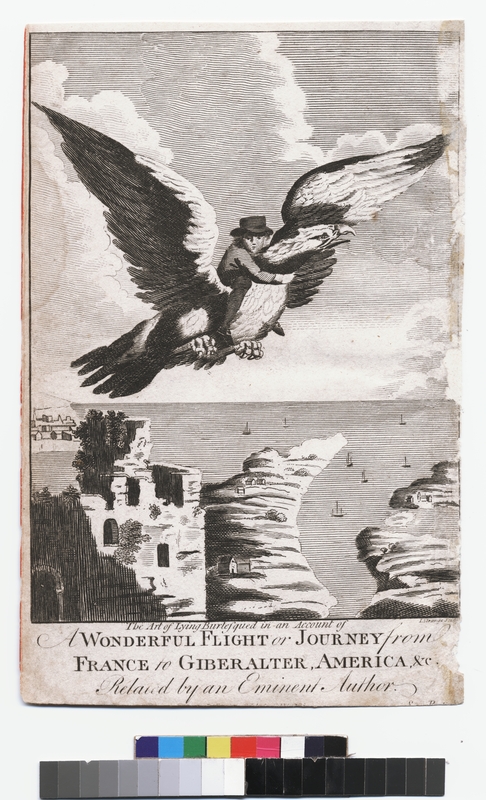 The print was linked with an account in the first volume entitled “An Extraordinary Flight on the Back of an Eagle over France to Gilbralter, South and North America, the Polar Regions, and Back to England, within six-and-thirty-Hours,” which offered a first-person narrative of one person’s extraordinary adventures, having accidentally ended up sitting astride a nesting eagle while exploring a ruined temple on the Island of “Thanet.” A brief prefatory comment explained to readers that the account was an extract from a text by (in reality Rudolph Erich Raspe, a well known humourist). This particular story, it explained, was a “satire upon those Writers and Travellers who have renedered themselves ridiculous by the number of montrous and and incredible Stories related in their works.” Although the main target of this satire was the exagerated tales included in many published travelogues of the day, its dramatic vision of a boy holding tight to an impossibly large eagle would also have evoked the more farcical side of the ballooning phenomena, which was itself a favourite theme in many satirical prints in the mid 1780s. This image, and the story with which it was linked in The Wonderful Magazine, highlighted the connected textual realms of published tales about balloon flights and travel narratives generally. London (the publication site of The Wonderful Magazine as well as Gulliver Revived) and Oxford ( the publication site of Respe’s original text, which was entitled Baron Munchausen's Narrative Of His Marvellous Travels And Campaigns In Russia). This image was linked to a story in The Wonderful Magazine, And Marvellous Chronicle; Or, New Weekly Entertainer. A Work Recording Authentic Accounts Of The Most Extraordinary Productions, Events, And Occurrences, In Providence, Nature, And Art (London, 1793). As The Wonderful Magazine acknowledged, the story had been extracted from Rudolph Erich Raspe’s spoof on travelogues entitled Gulliver Revived: Or, The Vice Of Lying Properly Exposed Containing Singular Travels, Campaigns, Voyages, And Adventures In Russia, The Caspian Sea, Iceland, Turkey, Egypt, Gibraltar, UP The Mediterranean, ON The Atlantic Ocean, And Through The Centre Of Mount Aetna Into The South Sea. Also, An Account Of A Voyage Into The Moon And Dog-Star; With Many Extraordinary Particulars Relative To The Cooking Animal In Those Planets, Which Are There Called The Human Species. By Baron Munchausen. This text, which was identified as a “third edition,” was an expanded version of Rudolph Erich Raspe’s Baron Munchausen's Narrative Of His Marvellous Travels And Campaigns In Russia. Humbly Dedicated And Recommended To Country Gentlemen; And, If They Please, To Be Repeated As Their Own, After A Hunt, At Horse Races, In Watering-Places, And Other Such Polite Assemblies; Round The Bottle And Fire-Side, which he had published the same year in Oxford. The image served as the frontispiece to The Wonderful Magazine, And Marvellous Chronicle; Or, New Weekly Entertainer. A Work Recording Authentic Accounts Of The Most Extraordinary Productions, Events, And Occurrences, In Providence, Nature, And Art, though it was linked to a tale entitled “An Extraordinary Flight on the Back of an Eagle over France to Gilbralter, South and North America, the Polar Regions, and Back to England, within six-and-thirty-Hours.” Written by the humorist, Rudolph Erich Raspe, it was intended as a satirical account of the exagerated claims of published travelogues. This image was linked with a satirical critique of the exaggerated tales of travelers. The balloon craze had itself been accused of promoting an atmosphere of hyperbolic claims and textual embellishments. The satirical nature of this print and the story that it illustrated highlighted the compromised cultural location of travel narratives and ballooning, which frequently aligned themselves with an Enlightenment commitment to the pursuit of knowledge, even as they catered to the public’s love of novelty and exaggerated claims in order to cater to readers who were more attracted to the novelty than the wonder of ballooning as a scientific breakthrough. This illustration was linked to a story included in the first volume of The Wonderful Magazine, And Marvellous Chronicle, originally by the humourist, Rudolph Erich Raspe, whose book, Gulliver Revived; Or The Singular Travels, Campaigns, Voyages, And Adventures Of Baron Munikhouson, Commonly Called Munchausen, satirized the exagerated claims of many published travelogues. Baldwin, Thomas. Airopaida. London: J. Fletcher, 1786. Burke, Edmund. “Enquiry into the Sublime and Beautiful,” The Norton Anthology of Theory and Criticism, Ed. Leitch, Vincent, B. New York and London: W. W. Norton & Company, 2001. Cavallo, Tiberius. The History and Practice of Aerostation. London : printed for the author, and sold by C. Dilly; P. Elmsly; and J. Stockdale, 1785. Cruikshank, George. George Cruikshank’s Table Book, Abbot Beckett, Editor. London: Punch Office, 1845. De Bolla, Peter. The Education of the Eye: Painting, Landscape, and Architecture in Eighteenth-Century Britain. Stanford, CA: Stanford University Press, 2003. Illustrations of Natural Philosophy. London: Reynolds. 1850. Keats, John. Complete Poems. Stillinger, Jack, Ed. Cambridge, MA and London, England: The Belknap Press of Harvard University Press, 1982. Holmes, Richard. The Age of Wonder: How the Romantic Generation Discovered the Beauty and Terror of Science. UK: Harper Collins, 2008. Oxford Dictionary of National Biography. Oxford University Press. 2004-9. Stewart, Susan. On Longing. Durham and London: Duke University Press, 1993. The London Packet; Or, New Lloyd’s Evening Post, Issue 2310. London, 1785. "The New Spectator with the Sage Opinions of John Bull,” No. 1 (3 February 1784) - No. 25 (17 January 1786) London: T. Rickaby. Wakefield, Priscilla. Mental improvement: or, the beauties and wonders of nature and art. In a series of instructive conversations. Dublin: 1800. Wolf, Norbert. Romanticism. Koln: Tanshen, 2007. The Busy Body; A Collection of Periodical Essays, No. 15 (3 February 1787) - No. 25. London: C. Stalker, 1787. "The Art of Lying Burlesqued in an Account of A Wonderful Flight or Journey from France to Gibraltar, America, &c. Related by an Eminent Author."